A cactus is a succulent plant of the family Cactaceae. The word “cactus” derives, through Latin, from the Ancient Greek κάκτος, kaktos, a name originally used by Theophrastus (the successor to Aristotle) for a spiny plant whose identity is not certain. Blossfeldia Liliputana is the smallest cactus species in the world, with a mature size of around 12 mm (0.5 in) diameter. The flowers are white or rarely pink,up to 15 mm (0.6 in) long and up to 7 mm (0.3 in) diameter. This South American cactus is named after the tiny citizens of Liliput in Gulliver’s Travels. Cacti is the Latin plural of cactus, and some writers use it in English. Cactuses is the English plural. Dictionaries list both, and neither is right or wrong. Also, like many names of plants, the uninflected cactus is sometimes treated as plural. Botanists estimate that there are more than 2,000 species, grouped into about 175 genera, but there is much argument about the limits of both genera and species. Cactuses can survive from few to 300 years, depending on the species. Rhipsalis baccifera, commonly known as the mistletoe cactus, is the only species of cactus that is found naturally outside of the New World. One theory is that it was introduced to the Old World by migratory birds, long enough ago for the Old World populations to be regarded as distinct subspecies. The alternative theory is that the species initially crossed the Atlantic Ocean on European ships trading between South America and Africa, after which birds may have spread it more widely. Many other species have become naturalized outside the Americas after having been introduced by people, especially in Australia, Hawaii, and the Mediterranean region. Cactuses occur in a wide range of shapes and sizes. The fruits produced by cactuses after the flowers have been fertilized vary considerably; many are fleshy, although some are dry. All contain a large number of seeds. Fleshy, colorful and sweet-tasting fruits are associated with seed dispersal by birds. The seeds pass through their digestive systems and are deposited in their droppings. Most species of cactuses have lost true leaves, retaining only spines, which are highly modified leaves. As well as keep the plant from being eaten by most animals, spines help prevent water loss by reducing air flow close to the cactus and providing some shade. Cactus spines can be short, long, soft or sharp depending on the species. Spines can be straight or have hooked tips. Spines grow on the stem in clusters out of small lumps or mounds, called areoles. Areoles occur in regular patterns on the stem. Cardon (Pachycereus pringlei) is the tallest cactus species in the world, with a maximum recorded height of 19.2 meters (63 feet), with a stout trunk up to 1 meter (3.3 feet) in diameter bearing several erect branches. All cactuses produce flowers. Areoles are where both spines and flowers usually originate. They are distributed in a pattern along the stems and sometimes have felt and long hairs. Again dependent on the cactus species, flowers can be white or a bright color such as yellow, orange, red, or lavender. 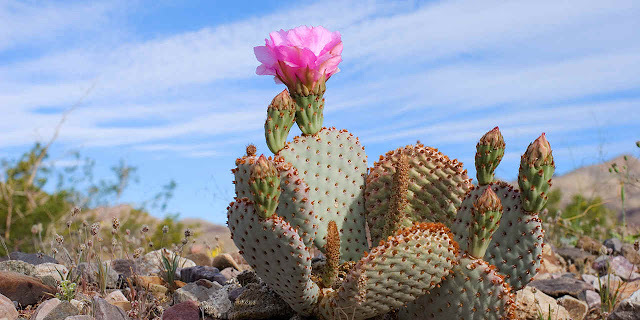 For most cactuses, flowers are short-lived; the bloom lasts only a few days. Some flowers open only at night. In a few species, the bloom opens for a day or less before withering and falling off. The short blooming period of cactuses lessens the amount of water that evaporates through their soft petals. Cactuses are only native to North and South America (with the exception of one species found in tropical Africa, Madagascar, and Sri Lanka). Cactuses inhabit diverse regions, from coastal plains to high mountain areas. Their range extends from Patagonia to British Columbia and Alberta in western Canada. Most cactuses live in habitats subject to at least some drought. A number of species of cactuses have been shown to contain psychoactive agents, chemical compounds that can cause changes in mood, perception and cognition through their effects on the brain. Two species have a long history of use by the indigenous peoples of the Americas: peyote, Lophophora williamsii, in North America, and the San Pedro cactus, Echinopsis pachanoi, in South America. Both contain mescaline. In addition to their use as psychoactive agents, some cactuses are employed in herbal medicine. Cactuses were cultivated as ornamental plants from the time they were first brought from the New World. By the early 1800s, enthusiasts in Europe had large collections. Rare plants were sold for very high prices. For many animals such as the bighorn sheep and the antelope ground squirrel, cactus are an important source of food and water. Of the 141 species of cactuses on the IUCN Red List, 25 species are classified as Endangered and 27 are Critically Endangered. Several cactuses develop plantlets at ground level that, as offsets, reproduce the species vegetatively. The primary method of reproduction, however, is by seeds. Early evidence of the use of cactuses includes cave paintings in the Serra da Capivara in Brazil, and seeds found in ancient middens (waste dumps) in Mexico and Peru, with dates estimated at 12,000–9,000 years ago. Hunter-gatherers likely collected cactus fruits in the wild and brought them back to their camps. Opuntia ficus-indica, or the Indian fig cactus, has long been an important source of food. The original species is thought to have come from central Mexico, although this is now obscure because the indigenous people of southern North America developed and distributed a range of horticultural varieties (cultivars), including forms of the species and hybrids with other opuntias. Both the fruit and pads are eaten, the former often under the Spanish name tuna, the latter under the name nopal. For cactuses adapted to drought, the three main centers are: Mexico, the southwestern United States; the southwestern Andes, where they are found in Peru, Bolivia, Chile and Argentina; and eastern Brazil. The structure of cactuses enables them to survive in hot, dry climates. Most have thick, fleshy stems with a waxy skin surface. The stem acts as a reservoir to store water. The tough skin keeps the water from evaporating. In addition, surfaces of most cactuses can expand and contract to accommodate changes in the amount of water. Also in the absence of true leaves, stems carry out photosynthesis.